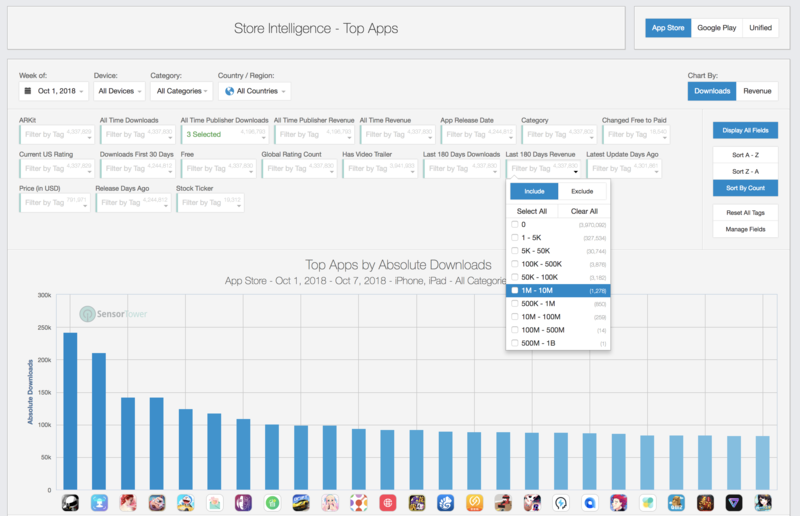 Sensor Tower’s Custom Fields surface the cohort of top apps and top publishers you are most interested in. View mobile games currently in soft launch, apps released in the past three months, publishers that surpassed one million downloads in the last 30 days, and more. You can also create your own custom fields and enhance your analyses to be more meaningful to your organization. With our Custom Fields feature, you can create your own Custom Fields to “Tag” any app in the app store with a custom field to further categorize it. For example, you could tag every competitor app with a custom field that states this app is a “Competitor.” Once created, you can filter any of Sensor Tower’s graphs with this new “Competitor” Custom Tag and it will only display these competitor apps. Custom Fields are available across Store Intelligence, Ad Intelligence, and Usage Intelligence products. Any Custom Fields you create will be visible by all individuals who have been associated with your organization by your Sensor Tower CSM. Before you can create and use Custom Fields, you’ll need to be added to an organization by your Sensor Tower Customer Success manager or by your company’s Sensor Tower admin account. Sensor Tower makes it easy to select a large number of apps (no limit) and Tag them all at the same time. When Mass Tagging, you must use a CSV file of all the App ID’s of the apps that you wish to tag. [A template CSV is available for download on Sensor Tower.] You can either manually pull these App ID’s from the apps and load them in one by one, or you can use Sensor Tower to download a CSV of the apps with their App ID's. For Apps you wish to Tag, either use the filters in Top Apps to narrow down the selection to the exact apps you want or add each app manually into App Analysis. Once you have all the Apps you wish to Tag, click Download CSV. From that downloaded CSV the App Id’s will be in one of the columns. You may use this same CSV in the next steps where we will actually add the Custom Tag to these selected apps. Once you have a CSV with all of the apps you wish to Custom Tag, delete all of the data in the CSV except for the App ID’s Column and if it is not there already, move the App ID column to the first column (Column A). Next fill out the Field Column with Fields of your choosing. Once the second column is completely filled out. Save the CSV. Navigate back to Sensor Tower’s Top Apps feature under Store Intelligence and click on Manage Fields on the right side of the screen. In Add Custom Field, enter the Custom Field name exactly as you entered in the top of the Column B.
Click Choose File and select the saved CSV file with our App ID’s and Custom Fields. Once the file is imported, the Custom Fields have been set! Ensure the new field is visible by navigating down the page and ensuring the check box under User Visibility is checked. Lastly, navigate back to any feature with Custom Fields and test out your new Custom Field!